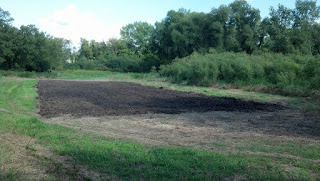 A food plot is an area set aside that is planted solely to act as a food source for wildlife. Food plots often consist of legumes, like clover, alfalfa and beans, and/or grasses. In an earlier post I made reference to lazy hunters. It might be suggested by some that only a lazy hunter would hunt over a food plot. I would argue that installing a food plot properly is not an act any "lazy" hunter would dare undertake. And to find my self hunting over that same food plot seems like a just reward for a whole bunch of hard work. First, I removed the previous cover of reed canary grass by mowing. Next, I needed to break up the thick layer of rhizomes, or the roots that makes reed canary such a prolific invader of native plants. Here was where the hard work started. I used a six-foot disc pulled behind a tractor to break up most of the thick mat of roots. Finally, the last step in soil preparation was conditioning the soil. I used a soil conditioner attachment on a Bobcat skid-steer. This helped further break up root and soil clumps. Those last two steps took six or so hours!